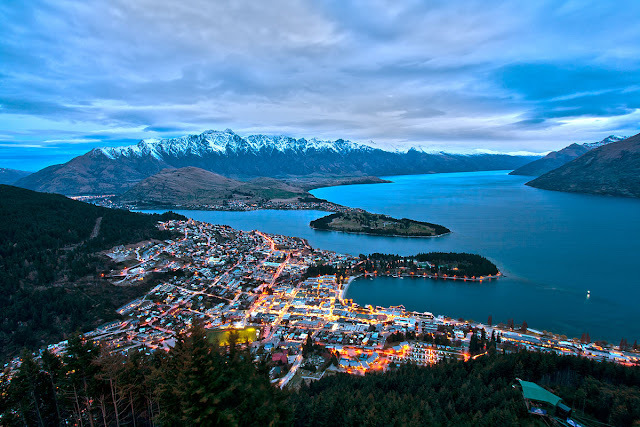 Queenstown is a city that has a reputation as one of the most exciting and interesting places in New Zealand, where visitors can enjoy a wide variety of different adrenaline sports on the rivers, lakes and mountains surrounding the town. Whether you have just spent the day relaxing by the lake and watching the world go by, or whether you have been bungee jumping, mountain biking or rafting, there are a range of restaurants offering good hearty food that will really hit the spot. When it comes to location, there are few restaurants in Queenstown that can boast the same kind of view as Finz, which enjoys a prime location overlooking the harbor on Lake Wakatipu. As the name suggests seafood plays an important role on the menu here, and while these are imported from the New Zealand coast, the prawns and salmon are very good, while the menu also has plenty of options of pork, beef and lamb that has been produced in New Zealand. The presentation is simple and effective, and shows off the quality of their ingredients, while the location helps to make this one of the most popular restaurants in town. The Brazz is a restaurant that doesn’t take itself too seriously, and while there are plenty of places in town for those looking for fine dining, this steakhouse offers generous portions of good meat and a variety of other dishes too. The location is convenient in the busiest part of Queenstown, and once you get inside the traditional bar and spacious tables and booths do give a relaxed atmosphere in the restaurant. While New Zealand Angus beef and Wagyu beef plays an important role on the menu, and is very good, there are plenty of other options such as fish and chips and pizza available. The True South Dining Room is one of the more upmarket venues in Queenstown, and is located within The Rees hotel, which is a charming boutique hotel located on the shores of Lake Wakatipu. Similarly to the Finz restaurant, True South enjoys a terrace looking out over the lake that is particularly suited for lunch or early evening dining, while the interior is beautifully furnished and cozy when the temperature drops. The menu changes every month to match what is in season and readily available, with chef Ben Batterbury preparing mouthwatering dishes with the best of South Island ingredients. The presentation of the food is excellent, while the range of wine available has high quality bottles from New Zealand and around the world. Like many of the restaurants in Queenstown, The Captain’s Restaurant is designed for comfort and revitalizing food for those who have spent their day outdoors, and is located in lovely rustic surroundings at the heart of the city. Steak and seafood are the main features on the menu, and the restaurant certainly shows off the wide variety of fish that can be caught in the waters around the coast, with the Stewart Island salmon being a particular highlight. For those who are enjoying winter sports in the Queenstown area, there is no better dish for warming up as a starter than the excellent seafood chowder. The Fergburger restaurant is one of the most popular burger joints in Queenstown, and is usually busy most evenings, even outside of the main tourist season. There are a wide variety of different burgers on offer from the standard quarter pounders to patties made of lamb, venison and chicken, and a felafel offering for vegetarians. While nobody can mistake a trip to Fergburger for fine dining, it offers excellent New Zealand burgers that are generously sized and are very tasty. The restaurant is also open late at weekends, making it very popular for those who have been clubbing and want something a little more substantial than the usual fast food.